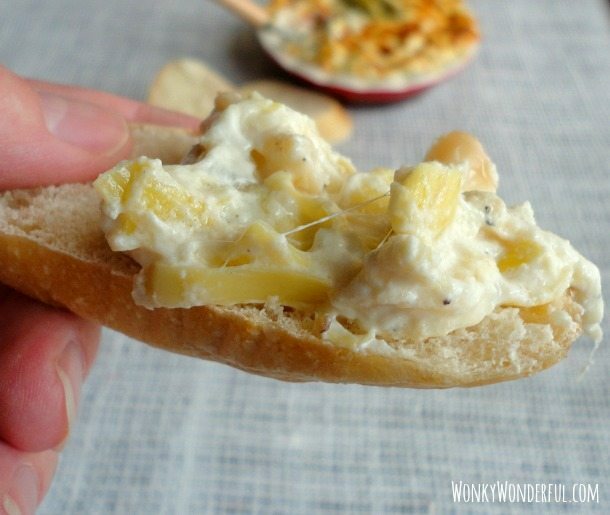 This is the perfect appetizer recipe for your upcoming holiday gatherings. This dip is creamy and overflowing with flavor. 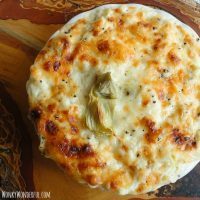 It is ooey-gooey cheesy goodness and extremely addictive. This is not your ordinary artichoke dip, it is bursting with pungent roasted garlic and melty cheese. We are all about the dips at my house! Our Christmas Eve dinner tradition is preparing a spread of appetizers and dips to munch on all evening while we watch movies and hang out. All in all it is a wonderful night and our favorite way to eat. 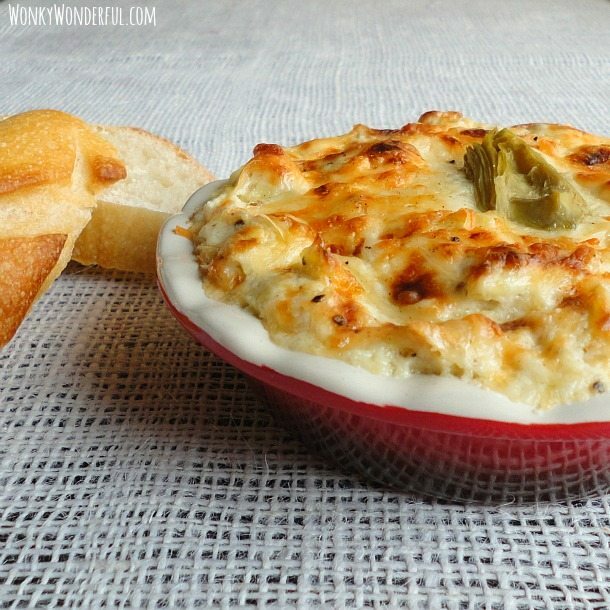 And this Artichoke Roasted Garlic Dip is a regular on our menu and always a crowd pleaser! Like I said, can you ever have too much garlic!?!?! Click this link: How To Roast Garlic – for full instructions and photo tutorial. First you will need to roast your garlic. See the How To Roast Garlic link below this recipe. Mash roasted garlic cloves with a fork until it becomes a thick paste. Thaw and drain the frozen artichoke hearts. Make sure you remove as much liquid as possible then chop artichokes into small pieces. Reserve 1/2 cup of the shredded cheese blend, put to the side. Mix all other ingredients together thoroughly and place into the desired baking dish. Top with the remaining 1/2 cup of shredded cheese. I also added a little more cracked pepper and an artichoke heart to garnish. Bake at 350 degrees for 25-30 minutes then broil for 3-5 minutes until the top is bubbly and brown. *If you are timid about garlic, use only one head of roasted garlic. **You don’t need this exact cheese blend but something similar with melty cheeses. This recipe makes approximately 3 cups of dip. If you are preparing this for a large group I suggest doubling the recipe. And there it is, just look at that ooey-gooey, creamy, cheesy deliciousness! Now it is time to Grub, Nibble & Nosh! It is best while hot, so make sure you dig in quick because it won’t last long. Serve with your favorite bread or crackers and Enjoy. I just made this dip for a New Year’s Eve party and it turned out so yummy. The only thing I did differently is I did not have any plain Greek yogurt but I did have a garlic and dill Greek yogurt dip. I also used canned hearts. The flavors with the roasted garlic, the dill Greek dip, the canned hearts and the cream cheese, oh my, so good. Thank you so much for such a yummy recipe. Awesome! Your version sounds wonderful. Happy New Year! Amazing! I peeled the cloves and roasted them on the stove top with olive oil. Used some of the garlicky oil to coat pieces of naan that were baked along with the dip. Divine. Used sour cream instead of Greek yogurt but I can’t imagine it made much of a difference. Thanks for sharing! Mmmm. Love the garlic oil coated naan idea! Ohhhhh this sounds so delicious! Hi, if I’m roasting the already-peeled garlic cloves that come in the resealable bag instead of heads of garlic, how many cloves (roughly) would that equal? 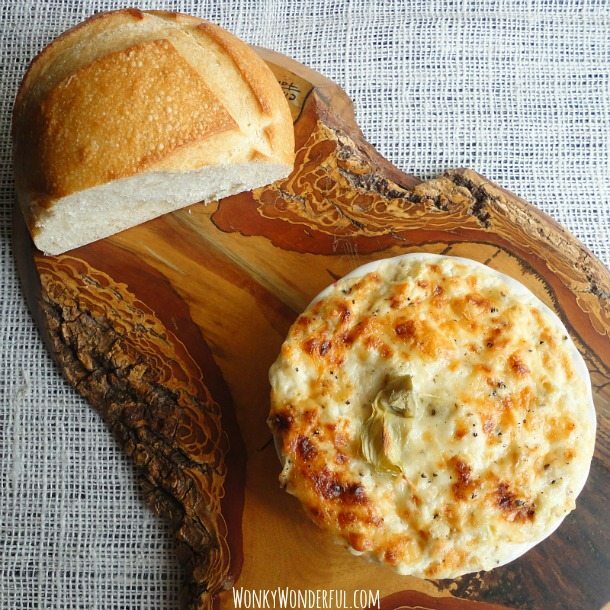 You do realize I’m artichoke dip obsessed, right?! Hi there- can you list out the cheeses? It’s been a while since I have made this and I can’t remember which they are and maybe I am missing something but I didn’t see the cheese listed. Thanks! There is an ad that is right in the middle of your recipe, which does not allow you to print even using your print button. When you put into a reading pane, you don’t see the ingredients at all. You might want to fix.